Posted on 4, April 2016 by EuropaWire PR Editors | This entry was posted in Chemicals, Germany and tagged Henkel, WC rimblock. Bookmark the permalink. Düsseldorf, 04-Apr-2016 — /EuropaWire/ — Record numbers for Bref Power Activ: Since its market launch in 2010, Henkel has produced 1,000,000,000 packs of the rimblock. In its four-in-one balls format, the innovation’s success has, in the meantime, spread to over 50 countries worldwide. 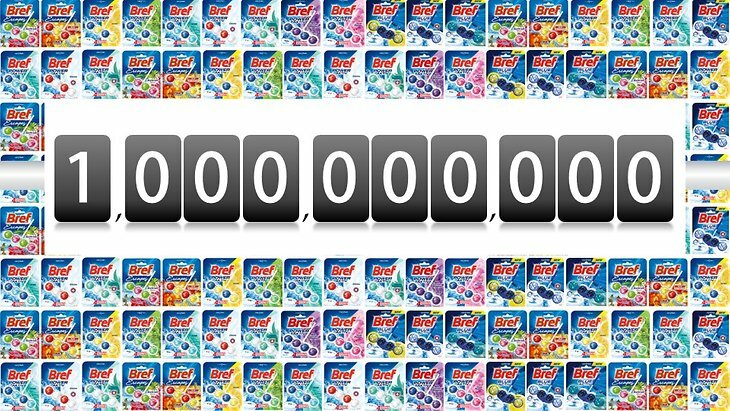 1 billion rimblocks for over 50 countries: Bref Power Activ is available in 13 fragrances. In more than 20 million households around the globe, Bref Power Activ has consistently provided sparkling cleanliness combined with a fresh fragrance. The WC rimblock offers a persuasive fourfaceted formula with a strong combination of cleaning foam, anti-limescale agent, dirt protector and extra freshness. And so the innovation leader in the WC hygiene market generated category growth of more than 30 percent, with sales in 2015 at over 300 million euros. In Germany alone, the rimblock known under the brand WC Frisch is breaking all records thanks to this product line with a market share of 50 percent. Since March 2016, the product has gained market leadership in almost 20 countries and is even available to consumers in Australia and New Zealand. After the acquisition of the leading Colgate-Palmolive detergent brands in this region, Bref has become the first global brand of Henkels business unit Laundry & Home Care introduced onto the shelves of all retail partners in the new markets “down under.” In the UK and Ireland, too, the product is now on the market following the integration of the Spotless Group. From the first handcrafted balls to the big success – read more about the development of the rimblocks.